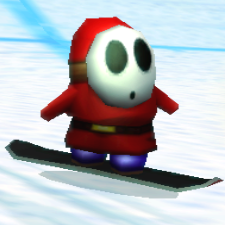 Shy Guy Snowboarders are a type of Shy Guy that appear in Mario Kart Wii's DK Summit. They ride around the hill's track on snowboards while performing tricks. If a racer runs into one of them, they spin out and slow down. ↑ Hodgson, David S. J. Mario Kart Wii Premiere Edition. Page 34. This page was last edited on March 5, 2018, at 21:20.